Two minutes in the hand is all it takes to convey the message that this book is not only a quality publication, but a labor of love. From the beautiful color illustration spanning front and back covers (see above) to the map inside both front and rear covers showing the location of German stoneware centers, from the side-by-side English and German text to the lavish full-color, full-page illustrations, this book is a first quality publication. Years in the making, the book was the brainchild of SCI Master Steinologist Les Paul. Born out of his frustration with attempts to learn about early German stoneware, he determined to provide stein collectors with a well-illustrated and comprehensive survey of early German stoneware steins. The book is a collaboration by three of SCI's most widely recognized experts: Les Paul, the collector, enthusiast and patron; Dr. Beatrix Adler, art historian and researcher; and Johannes Vogt, expert on early steins who consulted on the book and served as photographer. "Early Stoneware Steins from the Les Paul Collection", Dr. Beatrix Adler, Krüger Druck + Verlag, Dillingen/Saar, Germany, 2005, ISBN 3-00-013965-6. Photography by Johannes Vogt, Munich. Large format (9½" x 12"), hardcover, heavy stock, 464 pages. Side-by-side English-German text. 181 items fully described and illustrated in 119 full-page color photos, with numerous supplementary illustrations, including maps. This is an important book for collectors who have even passing interest in early German stoneware steins. As is pointed out in the introductory chapter on "Stoneware", and reinforced with a graphic showing the timeline of stoneware production in each of the major centers of production, the artistic merits of stoneware reached their highpoint in the 16th and 17th centuries, the so-called "Golden Age." A turning point was reached in the early 18th century, after porcelain was successfully produced in Germany. Porcelain, glass and faience were increasingly available and fashionably desirable. The color palette of stoneware, severely restricted by the high firing temperatures required, could not compare to the variety of colors and the details which could be shown in decorating these other materials. The "Golden Age" of stoneware artistry came to a conclusion around 1725. Although many fine pieces were produced following that date, emphasis increasingly focused on production of simple utilitarian wares, and the artistic creativity of the German stoneware centers began to fade. Prior to the 19th century, the study, research and written history of art focused on the classical fields of architecture, painting and sculpture. An appreciation for ceramics as an art form did not emerge until the Paris World's Fair in 1855, and the first serious studies of ceramics were not published until 1878, a full 150 years after stoneware production peaked and began its slow decline. Since that time there have been numerous studies published about one stoneware center or another, but very few broad surveys. The following timeline makes it clear that this book addresses a gaping hole in our study of this topic. 1500 - With Cologne leading the way, the stoneware centers of western central Germany entered their most artistically productive period. 1550-1650 - Stoneware production spreads to the Westerwald and eastward into Thuringia, Saxony and Silesia. 1725 - The creative "Golden Age" of German stoneware production passes its peak period. Competition from faience, glass and porcelain leads to a turn towards utilitarian wares. 1855 - The Paris World's Fair gives rise to the term "arts and crafts" and ceramics is recognized as an art form, although emphasis is given primarily to porcelain. 1878-1894 - The first studies of the artistry and history of stoneware production appear. All are limited in scope and contain various degrees of inaccuracies and errors. 1892 - One of the most significant 19th century studies of stoneware, "The Ancient Art Stoneware of the Low Countries and Germany" by Marc Louis Solon, was published. 1978 - Josef Horschik publishes his study of stoneware centers in Saxony, Thuringia and Silesia ("Steinzeug 15. Bis 19. Jahrhundert, von Bürgel bis Muskau", Dresden). 1997 - David Gaimster provides the first well-founded overall survey of stoneware production, although most attention is given to the Rhineland ("German Stoneware 1200-1900, Archeology and Cultural History", British Museum). From this we observe that no significant studies were conducted into early German stoneware until 150 years after the most important period of artistic achievement ended. In the intervening years, records, which may have been fragmented in the first place, were misplaced or lost due to fires or other ravages. Excavations and digs, an important source of historical evidence, were hampered by a lack of preservation of the sites, and in some cases by illegal digging and looting. Myths, untenable attributions and false terminology found their way into museum collections and then into print, giving them a false cloak of authority. Because earlier publications on this topic are not totally reliable, careful and extensive research was required for this book. In her Introduction Beatrix Adler notes that "A glance at the bibliography reveals that the research for this book has been extremely thorough… The state of research can vary greatly for each production center, i.e., the Rhineland has been studied and documented for a long time as compared to obscure centers like Wildstein, for which very little information is available. Westerwald stoneware, although represented with the largest chapter in the book, still needs detailed studies. On one hand it is amazing how much information we have on the potters or other specific aspects, and on the other, how little we know about stoneware production centers in general." Among the major studies of stoneware production, this book is the first to focus on stoneware steins, and only the third work published in English! Solon's book appeared in 1892, and no other significant survey work on this topic was published in English until Gaimster's in 1997. Les Paul, commenting on his frustration over the lack of written information on this subject in English notes "The American stein collector has to depend on bits and pieces of hand-me-down information that is often an untenable opinion or a distortion of the truth. We do not have the advantage of seeing these early pieces on display in our museums or having good references printed in English." The book begins with an introductory chapter which discusses terminology, the history of stoneware production, the uses of stoneware vessels, the clay deposits stretching across central Germany, digging, working and throwing the clay, decorative techniques, firing and salt glazing. The chapter concludes with two notable illustrations: A graphic timeline of stoneware production showing each center's rise and fall; and a graphic showing stein terminology as used in describing the steins discussed in this book. The meat of the book is provided in 17 chapters which follow. Presented in alphabetical order, each chapter deals with one center of stoneware production, using a standard approach. The first page is a map showing the location of the center as well as nearby cities and towns. Following a short geographic and historic sketch of the area, each chapter delves into the ceramic traditions, including the history of the local potters guilds, the source and nature of the clay deposits in the area, and a chronological discussion of local stoneware production, from its rise to its decline. 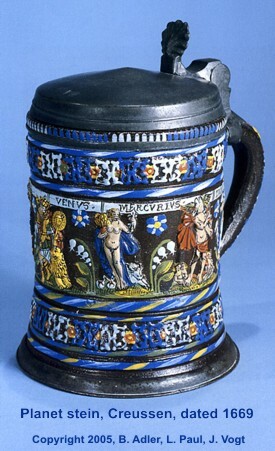 Special attention is given to dating the onset and demise of various shapes, colors, decorative themes and techniques, and glazes which provide the clues to determining both the age and the point of origin of these steins. Following this discussion, the highlight of each chapter is a series of large-format photographs accompanied by a complete narrative description of steins from the Les Paul collection. Each piece is described in context of the earlier text, thus illustrating the historical developments in each center's production. Of special interest in each chapter is an assessment of the state of research into the center. This chapter starts off by pointing out that "the fear of buying a reproduction at the price of an original is one of the reasons most stein collectors are afraid to invest in early stoneware and other 16th through 18th century steins. Reproductions and fakes are a serious problem for all valuable antiques and collectables. The term 'reproduction' refers to items which copy or imitate other works and are offered for sale with that understanding; 'fakes,' on the other hand are produced with an intention to deceive an unknowledgeable buyer. No one wants to be cheated out of their money, taken advantage of, or made to look foolish. This whole book, and now especially this chapter, will assist you to identify reproductions and fakes, and offer advice about buying early stoneware steins and ensuring their authenticity." 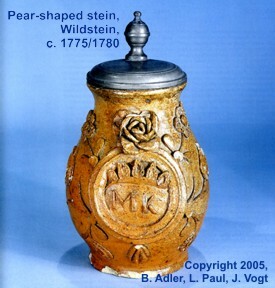 The chapter includes a number of illustrations of reproductions, accompanied by a discussion of how to use your knowledge of steins to protect yourself from mistaking a reproduction for an original. While it has the appearance of an appendix, a chapter titled "Catalogue" is not to be overlooked in the study of the pieces illustrated in earlier chapters. This chapter provides a detailed description of the physical characteristics of each of the 181 pieces, including photographs of pewter marks. The book concludes with an extensive bibliography and indices. As an aid to specialist collectors, the references are listed separately for each center of production. Brought to us by an enthusiastic stein collector with an unslakable thirst for knowledge about his steins, a ceramic art historian and researcher, and a recognized expert on early German drinking vessels, this book is an invaluable resource for stein collectors. The first time you make - or avoid - the purchase of an early stoneware stein based upon the information in this book, you will likely recoup your initial investment. Beyond that, this book will provide many years of enjoyable study.